In automotive differential is one of the key elements of the transmission. The differential is a mechanical linkage serves to transmit torque from the gearbox to the wheels of the drive axle. It represents an differential mechanism that decomposes one movement in two. Differential mechanism realizes kinematic connection between three or more units with the translational or rotational movement. Or a combination of both. The differential has two degrees of freedom. 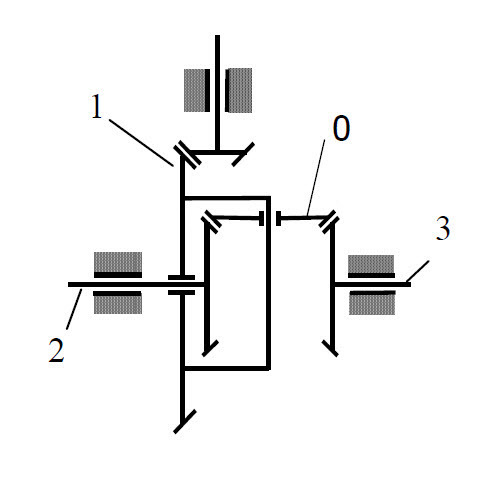 When the speed of the 2 and 3 output shafts are identical, the differential transmit torque from the input shaft 1 through the kinematic connection of the first degree of freedom. When speeds output shafts become different, then the kinematic connection of the second degree of freedom, the unit “0” equalizes torques for the exits. Exactly this second kinematic connection determines the characteristics of the differential. In turn, the path of the wheel, which is on the inside of the turn is shorter than the path that goes outside wheel. As a result, angular velocity of rotation of the inner wheel should be less than that of the outer wheel. If we have hard connection between wheels on the drive axle, then the car will not be able to turn normally because both wheels will attempt to travel the same path in the turn, which is impossible. The differential comes to solve this problem. It transmits the torque to the two separated axles for each wheel (output shafts 2 and 3) through its planetary gear (unit “0”) with random ratio of the angular velocities of rotation. As a result, the car can also move forward and turn normally.